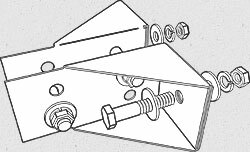 Contact Us for DeckLok Deck Bracket SystemsDeckLok Deck Bracket System by Screw Products, Inc. Contact Us For DeckLok® Advanced Lateral Anchor! For Lateral Loads, You Need A Lateral Anchor! The DeckLok Deck Bracket System DeckLok is a lateral anchor system that secures deck components to the structure of the deck. This patented lateral anchor system strengthens the vulnerable connections between deck components by adding a bolted attachment at critical structural locations. Contact us at Screw Products, Inc. to find out more about our products. See our Press Section for up to date news releases. For dealer and distributor info, please call or email. We welcome any questions or comments as well! Deck building, repair and remodeling are serious business. Please make sure you have the proper knowledge, skills, and tools to perform any services before starting. Please consult or hire a professional if there's any doubt.